This machine is used to press Laminates or Veneer on Plywood, MDF, Chipboard etc. 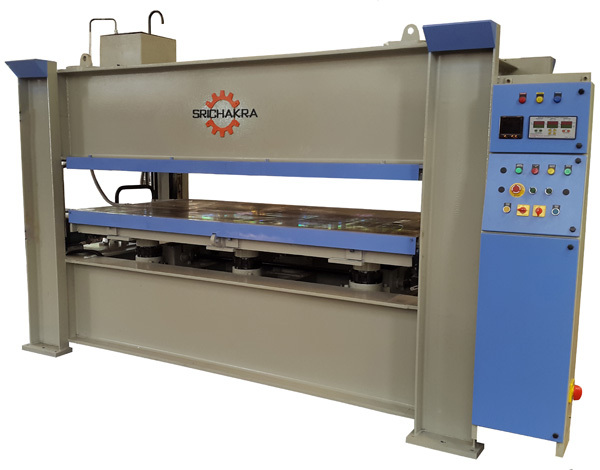 Srichakra Engineering Equipments is one among the very few manufacturers and suppliers of bonding press in India. These are also called veneer press or laminate press. Due to the optimized design and rigid structure of the press, the machine ensures the perfect bonding and best quality of products. The platens are ground with a tolerance of 40 microns which ensures high accuracy during pressing. Soild platens and high accuracy drilling ensures best quality and long life of the heating platens. Thermic oil heater of highest quality is provided to ensure the heating takes place quickly and efficiently. Digital controls ensure easy and smooth operation.